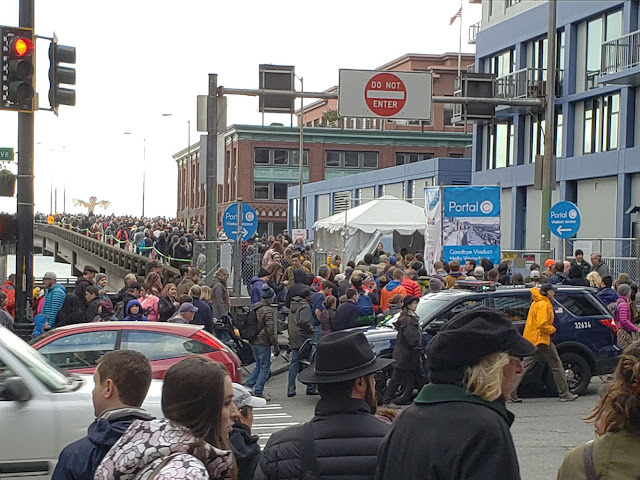 2/2/19 Hundreds of thousands of pedestrians walk on the Alaskan Way Viaduct. On our final day of driver’s ed, my car mates and I were supposed to drive on Interstate 5 to show that we could merge and achieve freeway speed safely. When it was my turn, however, my instructor wasn’t confident that I could drive at 55 mph safely, but he apparently thought I could handle 45 on Highway 99 instead. It was the first time I had ever driven on the Alaskan Way Viaduct. Since that summer of 1975, I have driven on the viaduct countless times, safely but often mindlessly. As a Seattle native, I usually took for granted the glorious views of Elliott Bay, the Olympic Mountains and downtown Seattle that the viaduct offered. 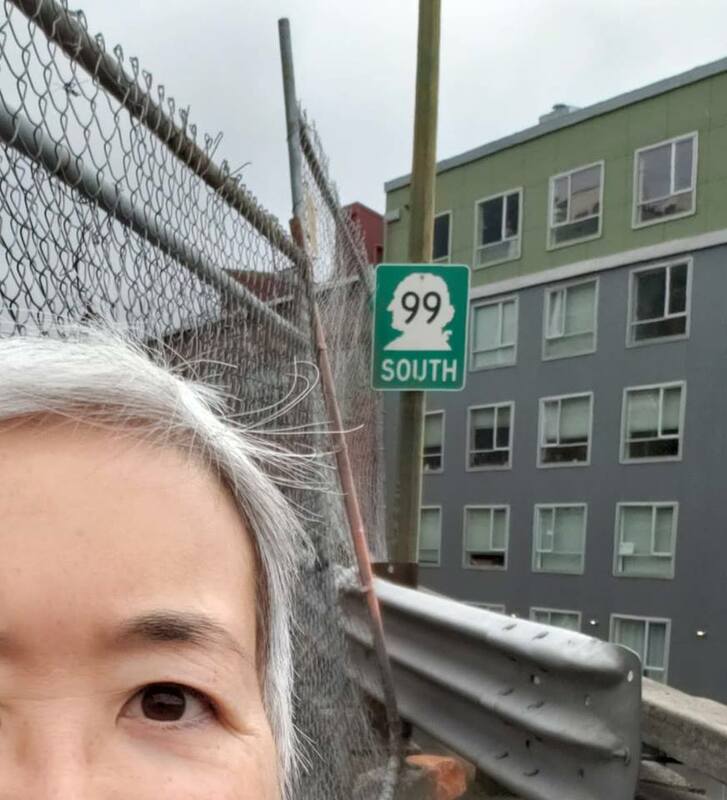 For me, it was just a way to get from point A to point B – an often convenient and faster alternative to I-5. It was Greg, a Midwest transplant, who taught me to appreciate the viaduct whenever he deliberately chose that route just for its views. 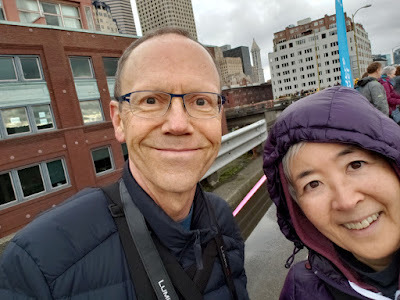 On the day before its closure and eventual destruction, we took a drive for one last glimpse of that view and to say good-bye to the viaduct. (I made my farewell sketch of it from the waterfront in December a few weeks before it closed.) I’m not exactly teary-eyed to see it go; dark, noisy and unsightly from the ground, the viaduct is a formidable barrier between our city and its waterfront. Built in 1949, it’s also a scary seismic risk. Still, it’s part of the city’s history and my personal history. 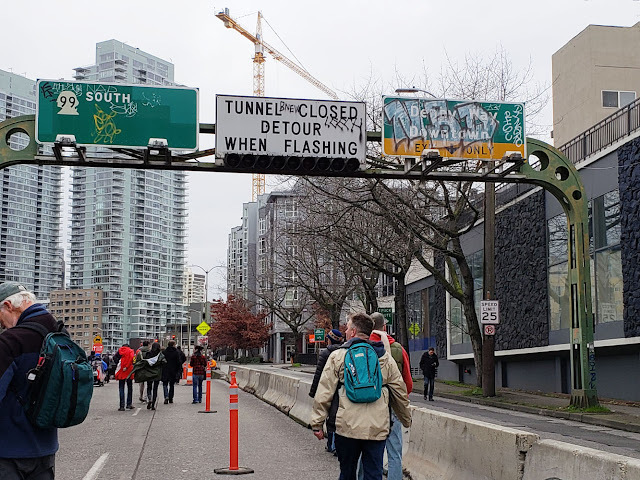 On Feb. 2 we got one more chance to bid farewell to the viaduct, this time in a way that has never been possible before: without a car! 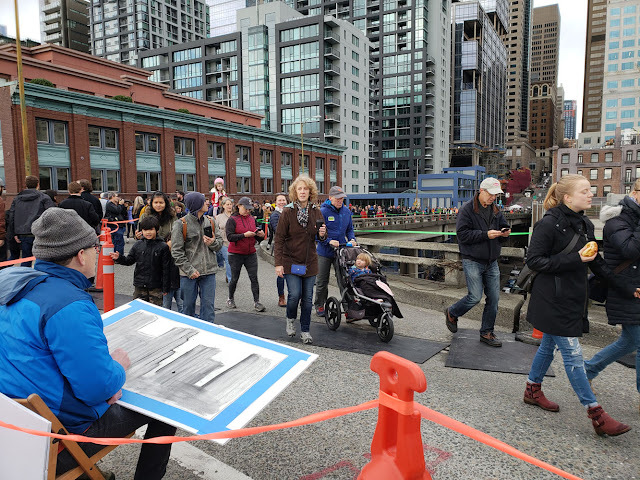 The public was invited to participate in a “community celebration” that allowed pedestrians to walk on the viaduct for the first and only time. 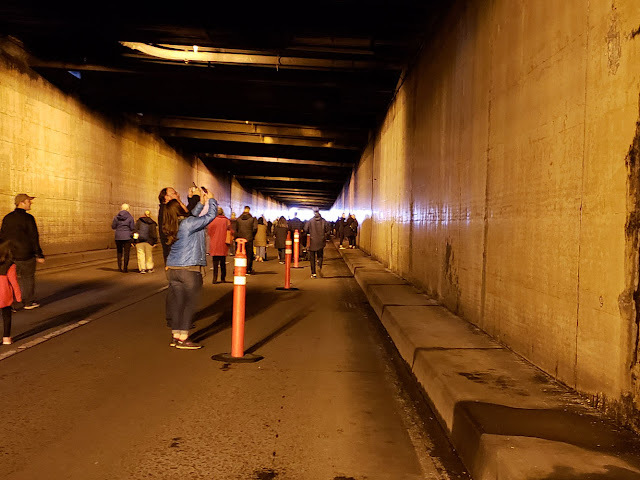 Along with 100,000 other people, Greg and I first walked partway through the new tunnel that will convey traffic in place of the demolished viaduct. I wasn’t very interested in seeing that part, but I figured it was as clean as it will ever be! Finally, the light at the end of the tunnel got brighter, and we walked onto the open viaduct. 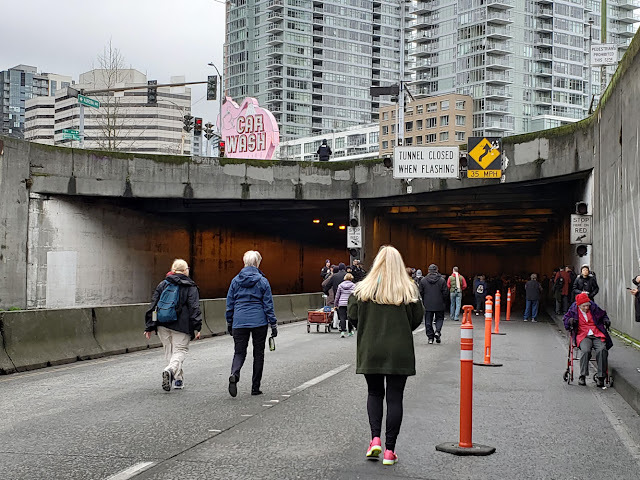 A woman nearby pointed to the Western Avenue exit and got a bit emotional as she exclaimed to her companion, “I’ll never take that exit again! I took it every day to get to. . .” He took her photo near the exit. It was fun and somewhat disorienting to be able to leisurely enjoy the views I’d zipped by so many times at freeway speeds. A bit overwhelmed, I couldn’t seem to get a bearing on what to sketch. I could have chosen one of those beloved city or waterfront views. But the really strange and wonderful part about the day was simply walking on the viaduct with so many other people. 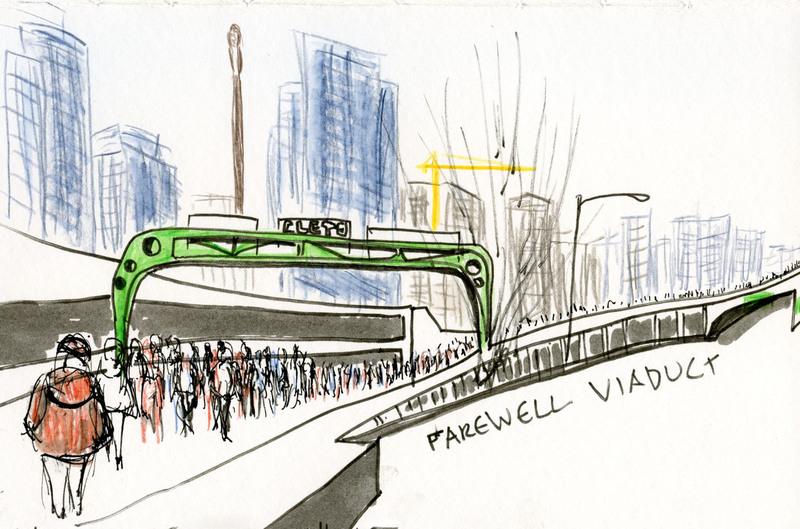 When we neared the Pike Place Market, I finally saw the sketch I wanted to make. I bellied up to a ribbon barrier where I could see thousands and thousands of pedestrians passing the market’s parking garage as the viaduct snaked southward. 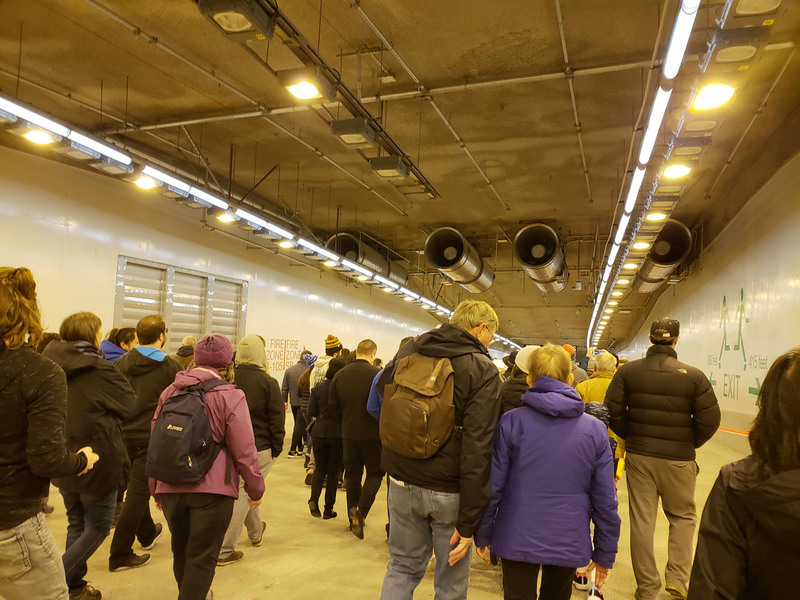 Walking past the Pike Place Market from below. I didn't see any sketchers I knew. This artist must have made special arrangements to get this seat! 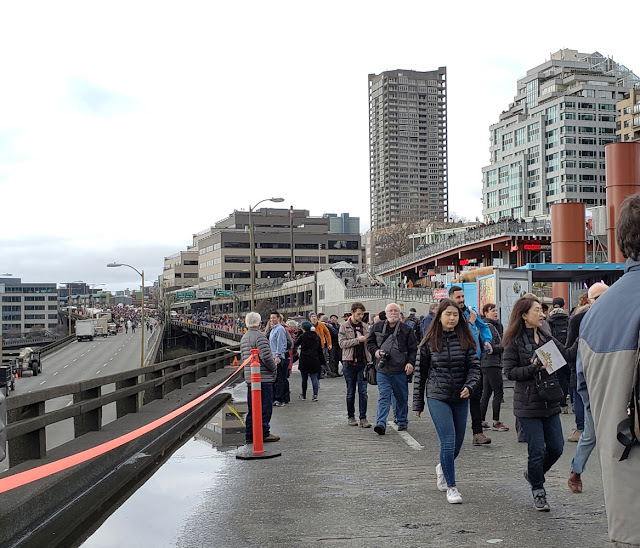 These people were all waiting to walk onto the viaduct as we were leaving. The line went down several blocks.